Moscow and Tehran unveiled a new series of measures including settling payments in roubles, constructing power plants, trading in consumer goods, besides allowing Russian companies access to oil and gas projects in Iran. The 11th Inter-Governmental Commission and Russian-Iranian Business Forum were held in Tehran last week, where the countries agreed to significantly increase economic engagement. “The Iranian market is attractive to large Russian companies engaged primarily in extraction, transportation, and processing,” Russian Energy Minister Alexander Novak said. “We are prepared to work on increasing the trade turnover.” Based on the assessment of the parties, it is currently $1.5 billion, but could increase tenfold within two years. The Chairman of the Russia-Iran Trade Council, Viktor Melnikov, said that Iran could supply Russia with pasta and agricultural products. The Vice-President of the Iran Chamber of Commerce, Mohsen Jalalpur, added that his country could offer Russia technology and cooperation in the area of constructing dams and water facilities, as well as cement plants. One of the main areas for cooperation is in power generation. Technopromexport (part of Rostech) has agreed to construct up to ten thermal power plant (TPP) units with a total capacity of nearly 3 GW, and modernize the existing TPPs. This includes the development of coal deposits. The total cost of all these projects will exceed $12 billion. According to Kommersant, Stroytransgas Engineering, which deals with laying pipelines, is one of the companies interested in infrastructure. An agreement about the electrification of Iran's railroads was signed between Russian Railways’ representatives and their Iranian colleagues. “There are six of these projects in all and we are preparing to sign the next agreement in November,” a member of the Russian delegation told the newspaper. The United Grain Company is willing to begin deliveries of 1.5-2 million tonnes of grain to the country, announced the company’s first deputy chief executive, Andrey Gormakh. He said that Russia and Iran are considering the possibility of a deal for the exchange of grain for oil. In turn, Iran could increase exports of fruits and vegetables to Russia in order to compensate for the termination of supplies of European agricultural products, which have fallen under Russian countersanctions. One of the main issues under discussion is the mechanism of mutual settlements. 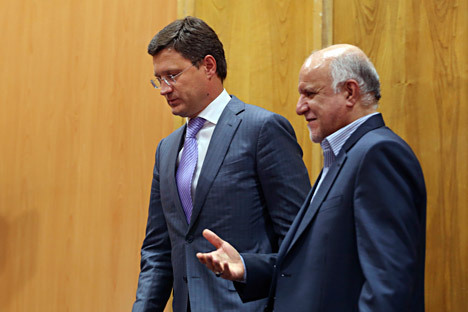 Alexander Novak said that “a study on the mechanisms of making payments in roubles and Iranian currency is in progress.” “We have agreed that the trade turnover between our countries will be organized on the basis of local currencies,” said the Iranian Oil Minister Bijan Zanganeh. Meanwhile, no concrete agreements on the supply of Iranian oil to Russia have been made yet. In August, the governments of Russia and Iran signed a memorandum on mutual understanding with a term of five years. After the signing of the memorandum, the Ministry of Energy announced that Iran offered Russia the opportunity to participate in the organization of supplies of its oil, including to Russia. The media called this deal “oil for goods.” However, on September 9, after the intergovernmental commission meeting, Alexander Novak told the Russia 24 television channel that Russia is not negotiating about oil supplies from Iran on a barter basis although the possibility of making such a deal exists. Information from reports in Interfax and RIA Novosti were used in this report.